“Like the nose of a camel under the tent, archaeological research has raised new questions about the Bible’s version of ancient history. Two researchers at Tel Aviv University (TAU) studied the bones of camels found in an area of ancient copper mines in the Aravah Valley, south of the Dead Sea. 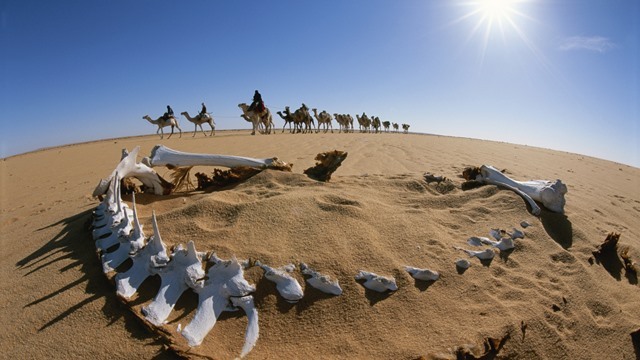 Using radiocarbon dating and other techniques, they determined that camels were first used in the mining operations near the end of the 10th century BC. They state that this is the first evidence of domesticated camels in ancient Israel. This would be almost 1,000 years later than the time of the patriarchs, when camels first appear in the Bible. The most memorable account is the story of Abraham’s servant, Eliezer, in Genesis 24, who is sent by Abraham to find a wife for his son Isaac. He finds Rebecca, who not only draws water from a well to quench Eliezer’s thirst, but also waters his 10 camels. Will camel discovery break the Bible’s back? But evangelical scholars say the claims are overblown. While it has been difficult for archaeologists and historians to pin down the exact time and location when camels were domesticated, there is evidence to suggest that the Genesis accounts are not a biblical anachronism. Two recent academic papers written by evangelical scholars—Konrad Martin Heide, a lecturer at Philipps University of Marburg, Germany; and Titus Kennedy, an adjunct professor at Biola University—both refer to earlier depictions of men riding or leading camels, some that date to the early second millenium BC. Among other evidence, Kennedy notes that a camel is mentioned in a list of domesticated animals from Ugarit, dating to the Old Babylonian period (1950-1600 BC). In an interview with Christianity Today, Kennedy said that he noticed archaeologists who work in Israel and Jordan seem to date camel domestication later than those who work in Egypt and Mesopotamia. “[Israel] doesn’t have much writing from before the Iron Age, 1000 BC,” he said. “So there aren’t as many sources to look at. Whereas in Egypt, you have writing all the way back to 3000 BC and in Mesopotamia the same thing.” Based on Egyptian and Mesopotamian accounts, Kennedy believes domestication probably occurred as early as the third millennium BC. Archaeologists usually remember that “absence of evidence is not evidence of absence.” The absence of evidence for Hittites once fueled some 19th-century debates over the Bible—until the vast Hittite empire was discovered in Anatolia. Questions about the Book of Daniel once focused on the absence of the prominently featured Belshazzar from Babylonian king lists—until it was discovered that Belshazzar was actually the son of Nabonidus, and co-regent. The many media reports which unquestionably accepted the TAU findings is also testimony to the fact that mainstream archaeologists and Bible scholars believe the Bible was written or assembled in the first millennium BC. They are highly skeptical of any historical information that predates that period. Bolen also observed that archaeologists at TAU support a low chronology for the United Monarchy of Israel, which minimizes the importance of David and Solomon, and typically weights archaeological evidence more strongly than the biblical account. “They’re thinking of this in terms of strengthening their position on the low chronology,” he said.